Add personality and sparkle to the basics. Scarf necklaces are part scarf, part necklace – and they lift your basic wardrobe. They add color during the day and sparkle for the evening. I wear mine as pictured above, but I also tuck them into a blouse or the ‘V’ of a jacket. I think that they project a fun, celebratory mood. In the past few weeks, a dozen friends have asked for my source of scarf necklaces. Here is the answer. I spotted a beautiful scarf necklace featured in the window of a posh boutique in San Francisco and asked whether Roarke is now in stores. The shop owner told me that the two founders have split. Laetitia has continued the online Roarke business, and Mignonne sells through boutiques under her eponymous brand. You can also buy Mignonne online. Her website offers a great selection of scarf necklaces. Most of Mignonne’s scarf necklaces are $425. Some are on sale for $255. ASE subscriber, Laurie G. wears a similar, beaded necklace and she shared her source with me – Fairchild Baldwin. They give the same sparkle and interest to the neckline that I like in the beaded scarf necklaces. $395 to $425. Fairchild Baldwin. Beth Ladd (upper West Side of Manhattan) offers a collection of Calypso and Mercer beaded scarf necklaces from $100 to $125. Beth Ladd Collections. 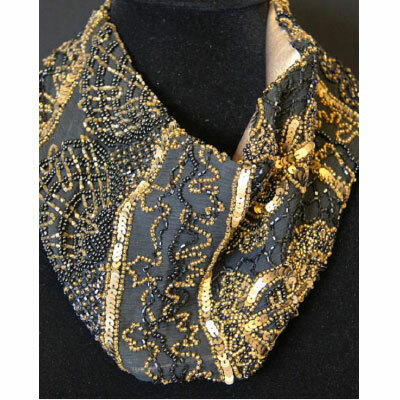 Renee Christopher offers evening black, golden and sparkle on Etsy for $325. Hint: Scarf necklaces are a secret to success for traveling light. You can dress up a basic shirt, jacket or dress with different looks. What To Do With All of These Great Photos on Your Phone?